I’ve recently completed a post dedicated to Rainbow wall art and decorations – as you can see here. 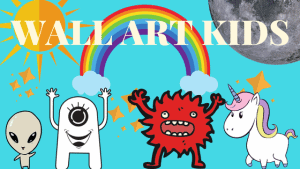 I thought it was about time I added a page dedicated to rainbow wall stickers too! 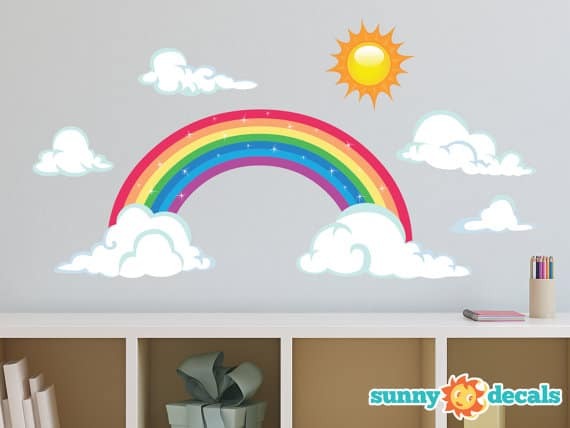 So, here is a variety of some of the best rainbow wall stickers I discovered on the web. I hope you find something you’re looking for, let me know if there is a particular style you’ve been searching for! Removable, reusable and non-toxic wall stickers. This decal comes with one sun and a variety of four clouds in different sizes. Brilliant for kids rooms and nurseries. 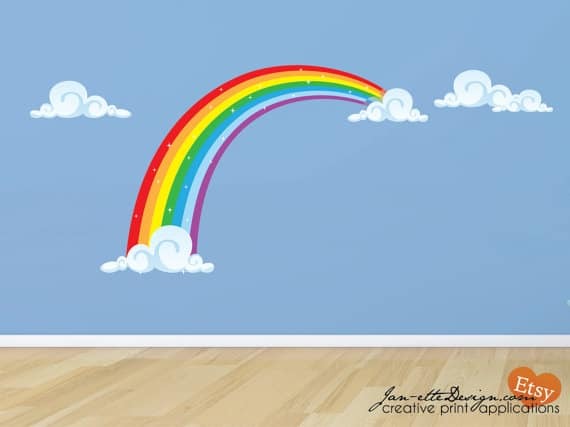 Large half rainbow fabric wall sticker, with cloud details. Ships worldwide from Texas USA. Reusable, removable, non-toxic fabric material. 40.5 inches x 63 inches. 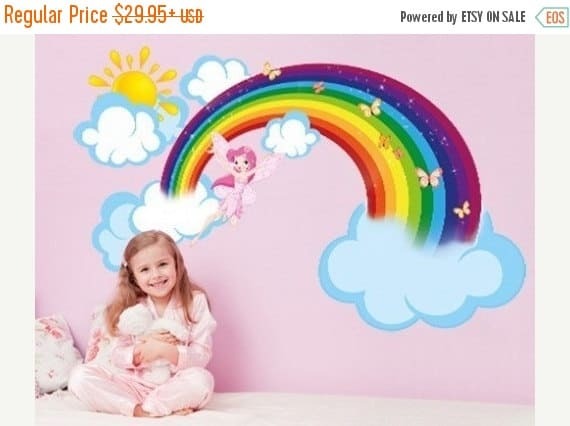 Perfect for a girl who loves rainbows and fairies, ideal for your child’s room or nursery, Lovely detailing with the little butterflies and fairy. Ships worldwide from California, USA. Instructions and free application tool. Dimensions: four different sizes available. 26 x 16 inches, 38 x 24 inches, 51 x 31 inches, 64 x 39 inches. 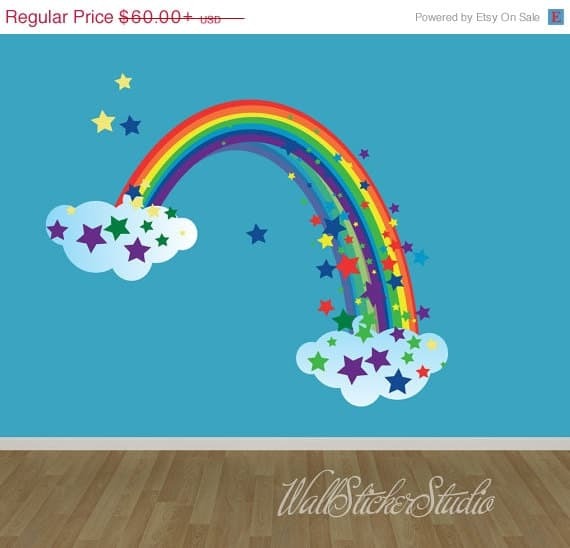 A very pretty rainbow wall sticker with an abundance of colourful stars. Simple applications, by peeling and sticking! Dimensions: two sizes available – 48hx36w and 36hx28w. 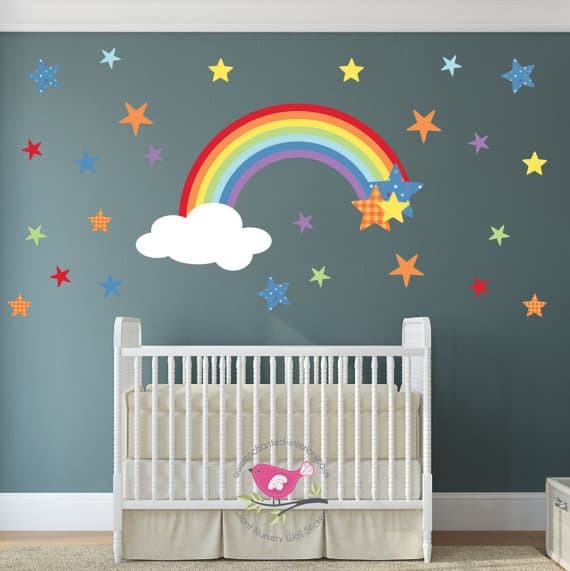 A lovely rainbow and stars wall sticker, perfect for a nursery. 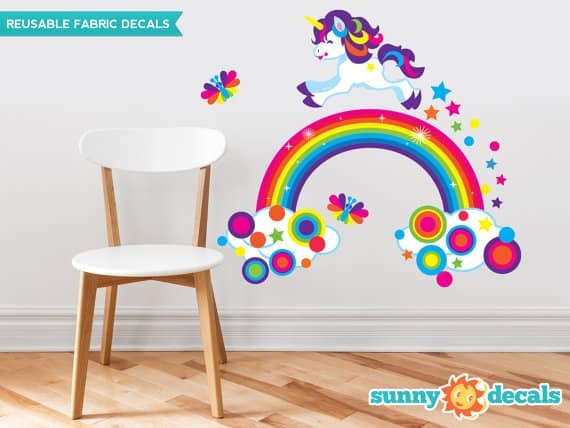 A lovely combo of a unicorn and rainbow wall sticker! Colourful and vibrant! 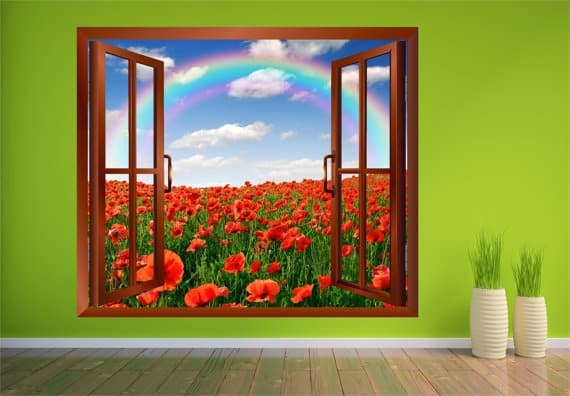 Open window effect rainbow sticker with cloud, sky and poppy detailing. Four sizes available, from small to x-large. Other posts that you may find interesting ….